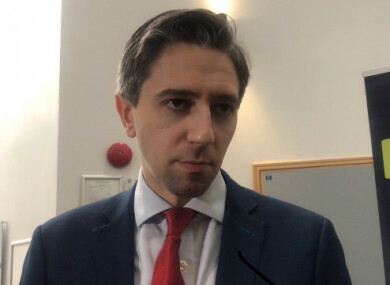 HEALTH MINISTER SIMON Harris has said Micheál Martin’s behaviour towards the former Tánaiste Frances Fitzgerald was “disgraceful conduct” and that he wants him to apologise. The former Justice Minister Frances Fitzgerald was effectively exonerated in yesterday’s Disclosure Tribunal report with regard to her dealings with the case of Maurice McCabe. Questions arose late last year about what she knew about the legal strategy being pursued against McCabe by the former Garda Commissioner Noírín O’Sullivan during the O’Higgins Commission. Political pressure mounted on Fitzgerald by both Fianna Fáil and Sinn Féin, which ultimately led to her resignation as minister last December. When the report was released yesterday, Harris, who previously worked for Fitzgerald before his time in politics, was the first to come out and welcome the report. Speaking to reporters today, he said he thought it was “disappointing” that the opposition had yet to apologise to her. He, [Micheál Martin] for political expediency, in an effort to march Sinn Féin, demanded her head on a plate. It was disgraceful conduct – he should apologise, correct the record of the Dáil, as should Mary Lou McDonald. Whether she gets reappointed to Cabinet, the health minister said, is the Taoiseach’s call. “I hope she continues to play a role in politics… I have no doubt she will continue to play a key role in Irish politics,” said Harris. Speaking on Newstalk today, Fianna Fáil’s Justice spokesperson Jim O’Callaghan said Fianna Fáil does not regret its actions last November and its lack of confidence in Fitzgerald. He stated it was based on wrongful statements, surrounding Fitzgerald’s knowledge of O’Higgins events, being made to the Dáil three times last November. Sinn Féin’s Louise O’Reilly told the Sean O’Rourke Programme today that the party accepted the findings of the report, but added that her party stand over their decision to demand her resignation. Email “'They demanded her head on a plate': Harris says Fitzgerald deserves an apology from opposition leaders”. Feedback on “'They demanded her head on a plate': Harris says Fitzgerald deserves an apology from opposition leaders”.